I just did this offer. I'm getting one razor shipped to me for $1 (paid by credit/debit card), and 600 Swagbucks (worth $6.81 on Amazon if you redeem in batches of 2200 points for $25) credited to my account within 3 days. 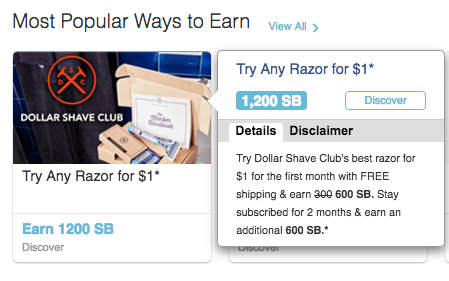 After the free trial, Dollar Shave Club doesn't actually seem to be a good deal, so I'm going to cancel; I'm only in this for the better-than-free deals, obviously. If you need a Swagbucks account, this is a good time to sign up using my link. We both get even more free stuff than usual, since they're doing a promo right now. And then you can get your friends free stuff, and they can get their friends free stuff, and since this is a damn pyramid scheme like all of these things are, the people who wait too long don't have anyone to refer to get free stuff. But even without referrals, anyone can still do deals like this razor thing, so go do it! I am a stay-mostly-at-home parent due to turns of events including a child with disabilities, relatives to care for, family members suddenly joining my household, and other unexpected situations that I can't imagine my life without. Many of the sites I've come across about making ends meet in Boston focus more on students and recent graduates; I wanted to create one to chronicle resources, struggles, and triumphs relevant to an established inner-city family with children. Unlike other "steals and deals" sites that help the site owner more than they help people looking for opportunities, anything I post here is something I or someone I know has personally used and been satisfied with. Some of the things I post here are purely for the purpose of sharing and others do make me a bit of money, but I never knowingly misrepresent anything.